FiberOpticx Xpress Fiber Connector - ST 50 micron - 6 Pack. SMP's Xpress Fiber Connectors are the new generation in field installable fiber terminations. 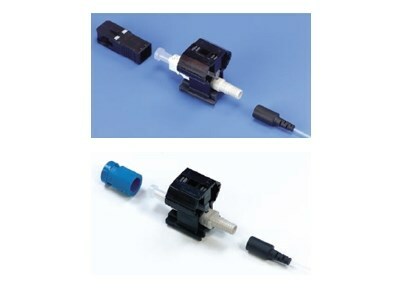 These connectors eliminate the need for messy epoxies and expensive tools by offering a pre-polished solution that can be installed in minutes. Xpress Connectors have a prestubbed factory polished ferrule that joins to the fiber using a precise mechanical alignment and a special low loss index matching gel. Each Connector comes with a specially designed clip that holds the clamping devices open for the fiber to be inserted. Once the fiber is inserted, squeeze the clip to release the blades, remove clip and discard.